My wife said, as she was preparing to bake a cake for a Fourth of July picnic, "The kids are really excited about this. Do you think you can turn it into an author birthday celebration?" I replied, "As a matter of fact, I can." Our author birthday celebrations normally do not happen like this. 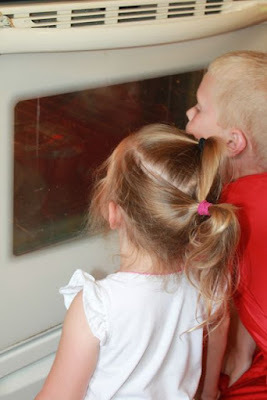 Sure, some have happened serendipitously (our 2014 celebration for Eric Carle comes to mind) and some celebrations happened very "last minute" out of the necessity to keep my children busy (our recent celebration for Gianna Marino comes to mind). However, I cannot remember a celebration happening after the family was already assembled to do an activity together and I was challenged to turn it into something more. But, that is exactly was happened this week when we celebrated author-illustrator, Wendy Watson. Wendy Watson is the illustrator of over sixty books for children including The Cats in Krasinski Square, written by Karen Hesse and Sleep is for Everyone, written by Paul Showers. 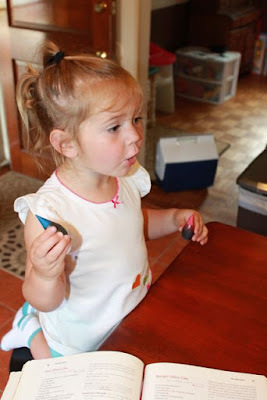 She wrote and illustrated over twenty books herself including Boo! It's Halloween and Bedtime Bunnies. As a child, she received her first art and writing lessons from her parents, Aldren and Nancy. Aldren A. Watson was an author and illustrator of over 175 books for children and adults, and over a dozen of his books were written by Wendy's mother, Nancy. Wendy wrote and illustrated her first book, Very Important Cat (1958), before she attended Bryn Mawr College where she earned a degree in Latin Literature. She later studied drawing and painting at the National Academy of Design in New York. Many of Wendy's books were collaborations with her family. 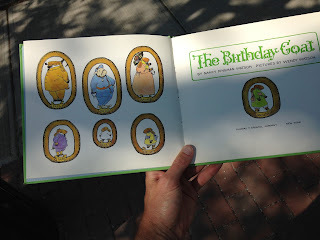 She collaborated with her mother on few books including The Birthday Goat, and many more with her sister, Clyde Watson (whose birthday is coming up on July 25th!) including the highly honored Father Fox's Pennyrhymes (National Book Award Nominee) and Applebet: An ABC (Parent's Guide to Best Books for Children, New York Times). My family loves Wendy Watson's Boo! It's Halloween. My boys love all the knock-knock jokes included in the illustrations. Anita Silvey wrote in her book The Essential Guide to Children's Books and their Creators, "In many of her illustrations, Watson has used cartoon-like balloons for her characters' speech, and she has encouraged her readers to pore over her illustrations by filling them with details not told in the text." Boo! It's Halloween is part of series holiday books Wendy Watson made in the early 1990s. This week, when I saw, Hurray for the Fourth of July at the library I picked it up thinking it would be fun to read it to my children for the upcoming holiday. 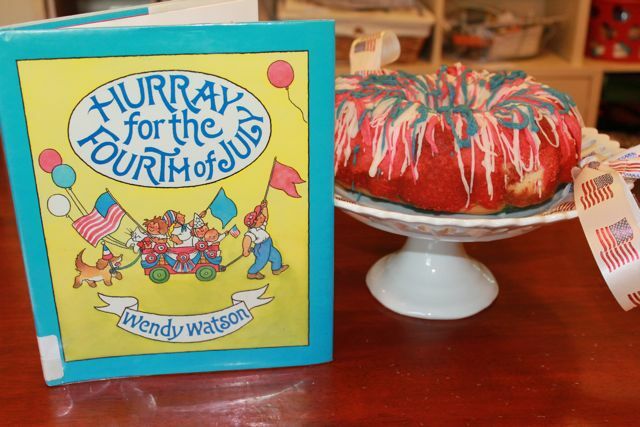 I knew Wendy's birthday was on the 7th and thought my children would think it was was cool that Wendy's birthday was so close to the Fourth of July and that she wrote a book about it. 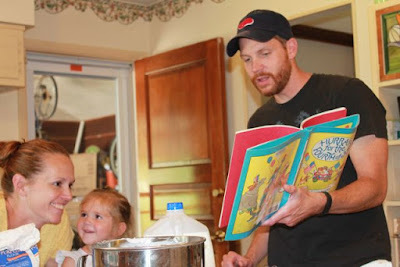 I had no idea we would use the book in a family author birthday celebration. Moments after my wife said, "Do you think you can turn it into an author birthday celebration?" I grabbed Hurray for the Fourth of July and was reading to my youngest daughter. 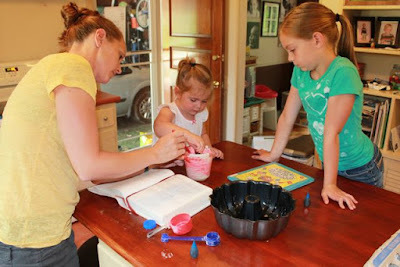 The kitchen was chaos; my oldest daughter was cracking eggs and separating the yolks, my youngest son was playing in flour, and I was reading the book. Despite all the activity everyone listened and repeated many of the rhymes included in the illustrations. The cake my children were so excited about was called "Fourth of July Fireworks Cake". 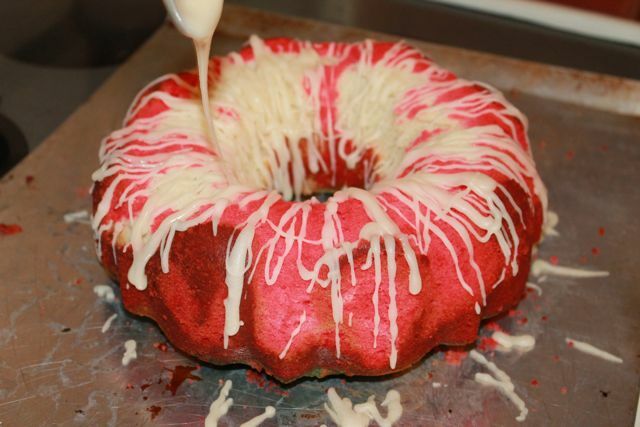 My wife found the recipe on Betty Crocker.com. We adapted the recipe by using a different cake batter recipe instead of using the suggested boxed cake mix. My youngest daughter was super excited to be in charge of adding the food coloring to the cake batter. "Add more!" said my oldest daughter. 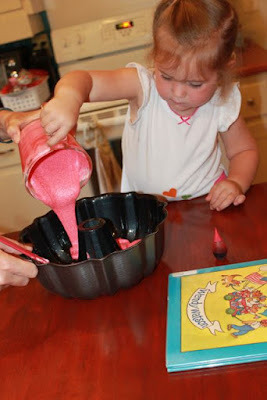 She used a lot of red food coloring so the cake wouldn't be PINK! 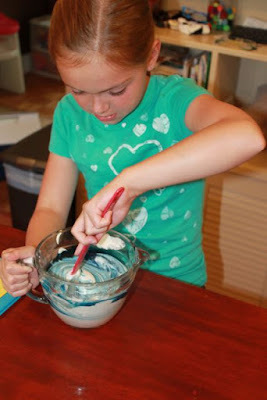 My oldest daughter mixed up the blue cake batter. 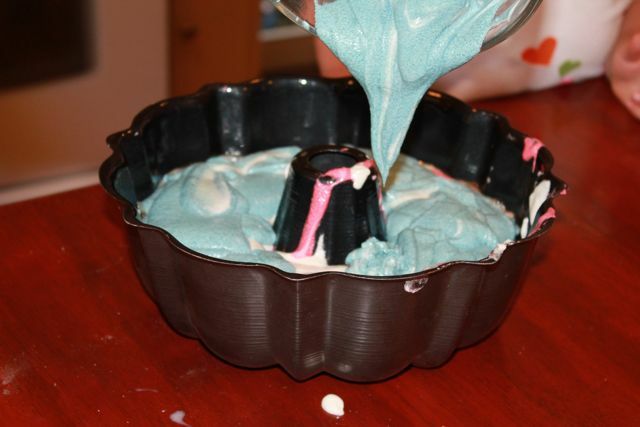 The red, white, and blue cake batter mixes were added to the pan. Little sis and big brother looked to see if the cake was done. 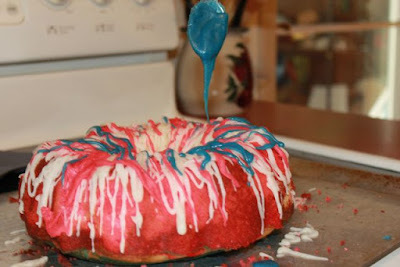 After the cake cooled we drizzled red, white and blue icing to look like fireworks! In Hurray for the Fourth of July, the family lights a candle on a birthday cake right before the fireworks start! 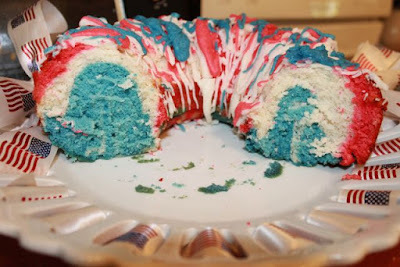 We were taking this cake to a 4th of July cookout. 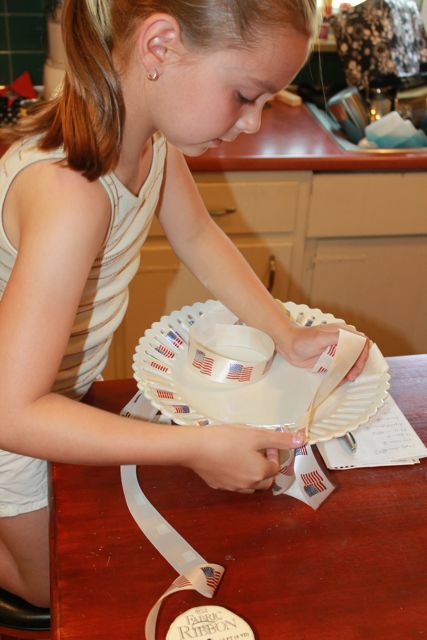 My daughter added an American Flag ribbon to our cake plate to make it look more patriotic. So delicious -- for America's birthday and Wendy Watson's birthday, too! Yesterday, I found a copy of The Birthday Goat at a local bookstore. A perfect time to find this fun book!